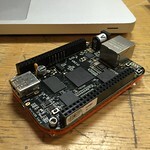 I picked up yet another BeagleBone Black the other day, inspired by the crazy deal at the local microcenter. So of course I need a case to put it in. I've worked with a few other cases I found on Thingiverse etc. but didn't get exactly what I wanted. There was a new one online that looked pretty good but they distributed it in pdf files which I think is a little lame. So I decided to make my own case 'from scratch' (without first making the universe). So I found the external dimensions and busted out some calipers for measuring the placement of the ports. I started drawing up the first plate in LibreCAD, which is alirght I suppose, but after a little while I found it rather frustrating. So I went back to the interwebs to find an alternative, free, open-source multiplatform 2D CAD application... and to my elated surpise I found QCAD. Apparently there are some paid features produced by a company, but so far I haven't even found out what those are. QCAD supports direct editing of dxf files and exports to SVG. I'm a big fan of the dxf files so I'm pretty happy with that. Anyway, the case I am working on is just a simple plate design, covering the bottom and the top. I am seeing how using only two plates works but I can add more if needed. I just started last night but hopefully it won't take too much longer. There is also a dream about making it have the features necessary for compatibility with patented 'stacking blocks' but I am not sure how I can do that very well with laser cutting. The DXF file is hosted on github and will be updated as I progress. If you have any comments feel free to use github or contact me however. I have the bottom plate done. Circular mounting holes are present and larger rectangular holes were added for fitting around the micro HDMI port and the mini USB port. I cut a test on some scrap acrylic when I should have been getting sleep but it turned out pretty great. I might go ahead and shrink the port holes a little bit for a more snug fit. While working on what would have been the top plate, I encountered a problem. There are a few features on the top of the BeagleBone Black that would make any tight fitting single layer plate not very effective at covering the whole thing or being reasonably sturdy. Clearly this is what others have encountered and why they chose ot go with many layer designs. So knowing that mine would turn out much like other I am putting this project on hold indefinitly. I have updated the bottom plate so the holes around the ports fit much tighter. I cut out the bottom plate from some bright neon orange acrylic and fastened it to my becent BBB, with some 4-40 bolts. M3 would be preferable but the only stuff I had was too short or two long. The result is pretty nice albeit very simple. March 16th, 2015: After some more consideration I have a good idea on how to make a top layer or two which will still be pleasing to me and my silly original concept. Hopefully I have time to work on that soon.